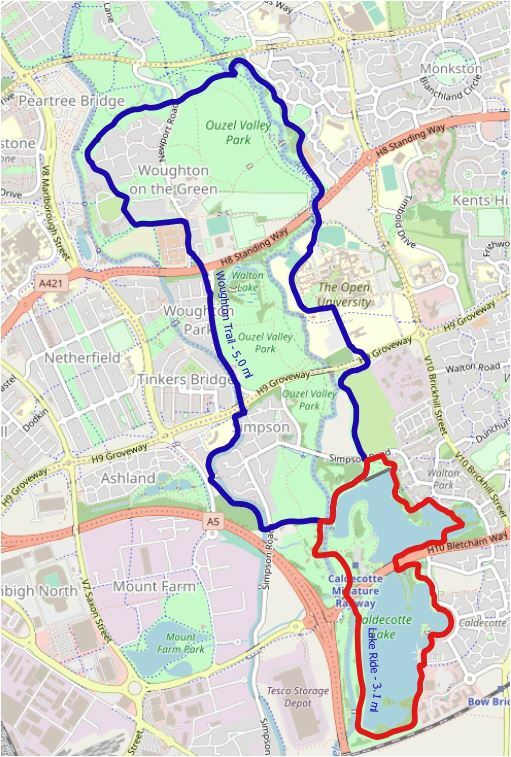 The Woughton Trail is one of the shorter routes from Caldecotte and initially follows The Ouzel Trail through The Open University campus and along the west side of the Ouzel Valley Park up to the point where it passes under Chaffron Way (H7). For details of this part of the route see The Ouzel Trail. As you approach Chaffron Way cross the Ouzel by the wooden bridge and head west on the redway to cross Newport Road towards Waterside on the Grand Union Canal. This is a pleasant stretch of redway which passes paddocks and picnic sites.